The birthstone for February is the wonderful purple amethyst and we have plenty of beautiful examples of jewellery created using this lovely stone here at The Earring Collection. 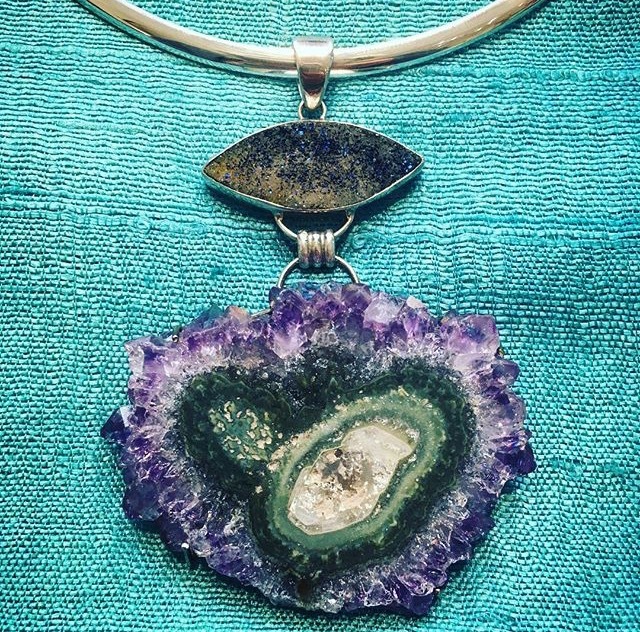 We adore the colour of the amethysts set in this sterling silver pendant. These beautiful pendants would make wonderful and affordable gifts for people who have birthdays this month. Amethyst is also one of the stones associated with the zodiac sign of Pisces. Lovely gift potential for February friends! from top to bottom £38, £24 and £38 respectively. 18'' Sterling silver snake chains £26 each. Amethyst was highly prized in the ancient world. The meaning of the name of the stone comes from the Greek, meaning 'to avoid intoxication'. Drinking vessels were carved from amethyst and it was worn to promote sobriety and clear thinking. The Ancient Egyptians also prized amethysts for their colour and rarity. In the Middle Ages in Europe, Amethysts were worn by royalty and higher ranking clergy. They were as precious as rubies, emeralds and sapphires due to their comparative rarity right up until the 18th century, when large deposits were found in South America. Today, amethysts are sourced all over the world and are a comparatively affordable gemstone that makes striking and effective jewellery. The amethyst is versatile and looks well paired with white, yellow and rose metal and ranges in hue from delicate lilac to more intense purples. The Earring Collection is a gorgeous jewellery boutique situated in the heart of Cowes, Isle of Wight. We specialise in hand-made silver, gold, and gemstone jewellery - with a particular enthusiasm for earrings. All our exquisite earrings are either designed by us, or designed for us, and all sourced directly from their creators, whether in the UK or across the globe. Blog © The Earring Collection. Powered by Blogger.